This entry was posted in Saugatuck, Transportation and tagged Saugatuck Avenue railroad bridge. Bookmark the permalink. I was driving a few cars behind the truck- he had some good speed going to get nearly half way through the underpass before coming to a stop! Living nearby, we see (& hear) these accidents all the time- not sure if alarm or warning system can be installed, but worth investigating. Being about 100 yards from our office, and happening every month or two, this is mildly entertaining, provided I’m not trying to get anywhere. Something tells me letting the air out of those tires wassn’t going to help. Provided no one is injured, I confess to not being above a little schadenfreude when it comes to this kind of thing, and given the right circumstances, almost any driver is capable of a massive attack of stupid — but it’s so much fun when someone sets the bar so high. Looks like he was going a bit too fast for a test run! Maybe next to the height sign town can put up a sign warning drivers to slow down when passing under the bridge? Probably not, Michelle. If they don’t heed the first sign, why would they bother with a second? Maybe the sign should say BRIDGE AHEAD! Couldn’t we investigate putting a hanging beam 30 feet ahead of the bridge, like they have in garages? Seems to me that this is occurring at a frequency that it might warrant the cost. I can’t imagine that it is good for the bridge and this might pay for itself in the long run. This is a great idea! Simple, cost effective, actionable! Jim Marpe, are you listening! It is a good idea, but it is probably something the state DOT needs to consider as it is a state numbered route. Does Waze warn drivers of low clearance? 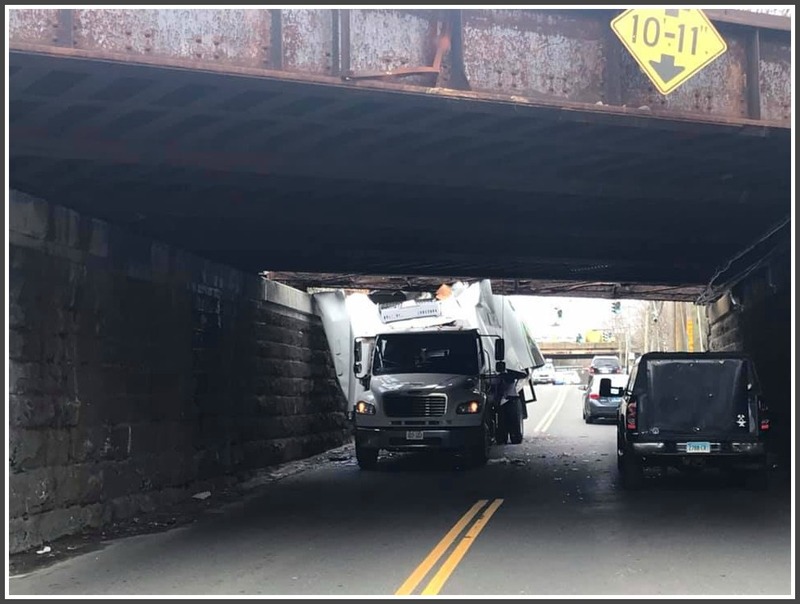 It’s not rare to hear large trucks backing up on Bridge Street when they realize they can’t squeeze under the trusses. 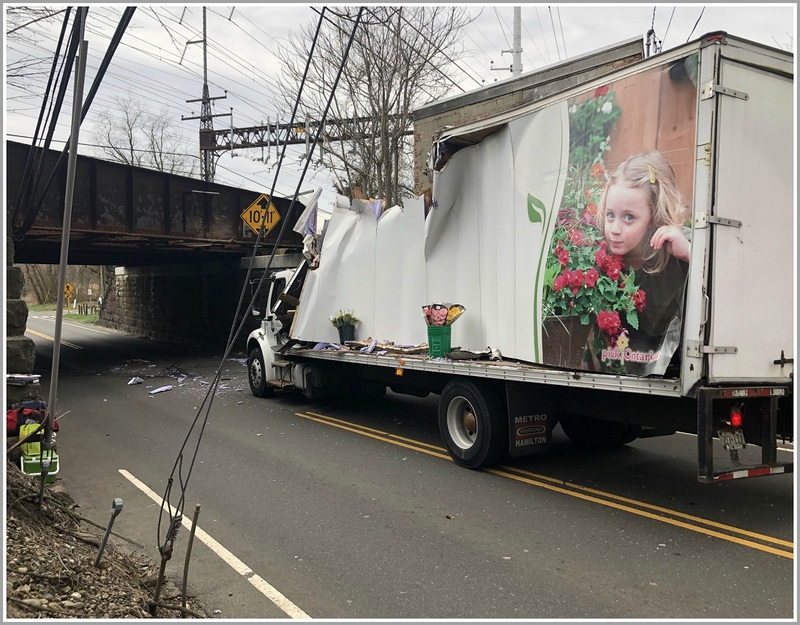 safety is the priority – additionally I would think these accidents are costly and covered by us tax payers … a massive increase in bridge strike fines may reduce the number of incidents !? what is the fine for a ticket for hitting the bridge? this happens way too often.. I saw the huge tow truck on Riverside with the most incredible crumpled mess on the flatbed. Incredible. I wish I could have taken a picture for your readers. Waze doesn’t have any provisions for different types of vehicles (they have “private,” taxi, motorcycle or electric settings – none help trucks), nor does Google Maps. That’s why you see so many trailers and other prohibited vehicles on the Merritt. I drive with a 24″ enclosed trailer and I struggle to get Waze or any other free GPS service to route me appropriately. Without a paid professional GPS app with provisions for truckers you have to do your own research in advance (my research is limited to knowing I can’t drive on the Merritt or Taconic). Professionals should know their route and not be guessing. 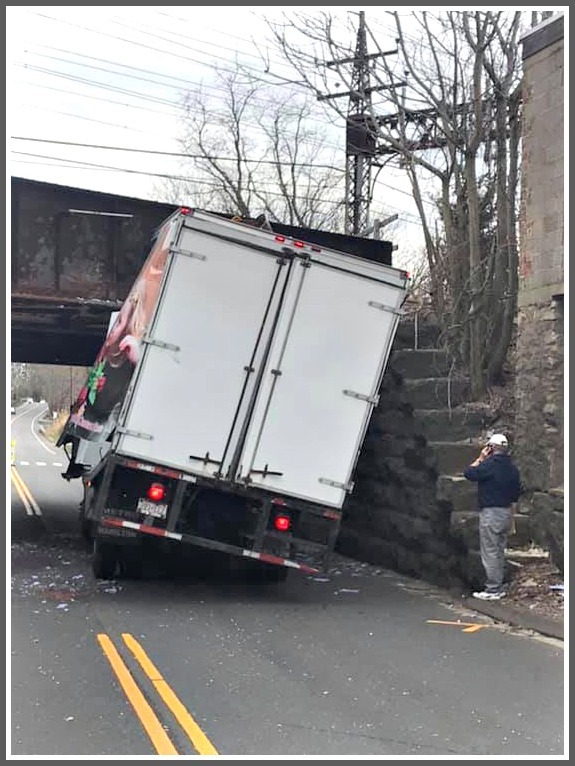 That bridge was not even remotely high enough for that truck and it should have been immediately obvious – there had to be some distraction going on while he was driving. Civilians drive Uhauls on the Merritt all the time, they usually get away with it but that doesn’t make it ok. I think rental places should be required to educate renters. And I should get one of those professional GPS apps that can route based on vehicle type and height. For what it’s worth, Dattco buses are equipped with an app that tells them which roads they are not allowed on. There are plenty of apps for truckers. No excuse this day in age. Sure it would be nice for Google to add the option/data but I am guessing they feel there is too much liability on them if they do.